Defender Simon Lappin has emerged as a possible signing for Championship leaders Cardiff City. Manager Malky Mackay has confirmed he is looking at signing the former Norwich City defender who was on loan at Cardiff City earlier in the season. Lappin left the Canaries by mutual consent in January following six years at Carrow Road after struggling to hold down a first team place. "He is certainly someone under consideration," said Mackay. The 29-year-old had a loan spell with the Bluebirds at the end of last year, making two Championship appearances before he returned to Norwich City. Lappin arrived at Carrow Road from St Mirren in 2007 and helped the club achieve back-to-back promotions. "We are still thinking about what we are gong to do in terms of defensive cover and we will make a judgement on that before the end of the month," said Mackay. "He has been here recently and he is someone that can comfortably play in a championship team. "He was a smashing professional when he came here, a good boy and a good personality to have around." Mackay confirmed he is expecting to midfielder Stephen McPhail to be out on a short-term loan. The 33-year-old returned to action in January for the first time since injuring his hamstring in August. McPhail has been hampered by injury and also suffers from a medical condition that requires continuous treatment. "A couple of people have spoken to us concerning Steve McPhail's availability in terms of a short-term loan," said Mackay. "He needs game time and both Stephen and myself will be looking at in the next coming weeks." 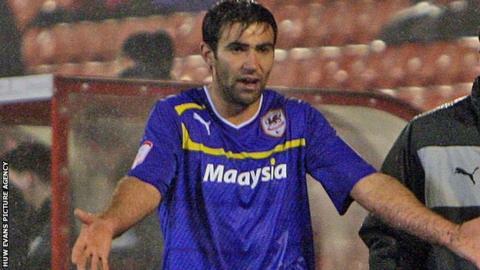 McPhail has made more than 200 appearances for Cardiff since moving on a free transfer from Barnsley in 2006 but is out of contract at the end of the season. The ex-Leeds United player was diagnosed with stage one malt lymphoma in November 2009 and then the autoimmune disease Sjogren's Syndrome last season. Although he hopes to prolong his playing career, McPhail wants to continue his association with Cardiff as a coach even if he decides to hang up his boots.